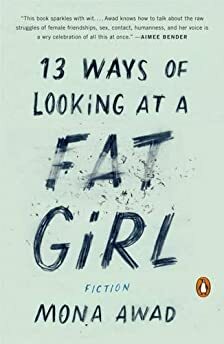 Largehearted Boy: Book Notes - Mona Awad "13 Ways of Looking at a Fat Girl"
Book Notes - Mona Awad "13 Ways of Looking at a Fat Girl"
Mona Awad's debut 13 Ways of Looking at a Fat Girl is a magnificent novel-in-stories about women and their bodies. "Absorbing . . . Subtle but poignant . . . This sort of intrafeminine aggression will be familiar to most women, whatever side of the body war they’ve been on. But it is is a side of experience that hasn’t been much explored by literary novelists." Music is a big part of my life and was particularly important to my novel, 13 Ways of Looking at a Fat Girl, because music is extremely important to my main character, Lizzie—as a comfort, as a shield, and as an alternative reality she could inhabit when she wanted to escape her own. I made separate playlists for each of the 13 chapters. I would listen to them when I was not writing to help me stay in the world of the story and to help me build and imagine that world more fully. Because each chapter explores a different phase in my main character’s physical transformation, a different relationship, a different way of looking at and being in the world, the playlists were really varied, ranging from the dreamy dark wave and Goth rock of her youth, to '60s and '80s pop, to jazz to neoclassical and then back again to dark wave. This list represents an amalgam of the 13 playlists I made while writing this book. The songs, played in this order, convey the arc of the overall story and serve as a parallel narrative to the novel in sonic form. The songs are also, ultimately, ways of looking—both out at the world from Lizzie's eyes and ways of seeing into her.